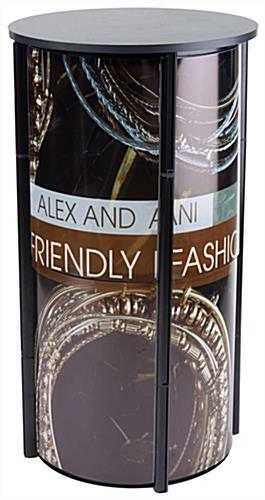 14-3/4" x 20" Posters slide-in behind each of the (6) lenses to promote products & services. 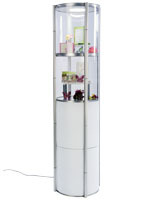 Panels are clear, allowing the counter to function as a display case – Poster channels are optional bonus feature! Twist and fold design provides quick and easy set up and take down. 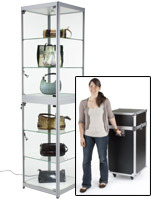 Expo counter includes a bag with trolley wheels & a retractable handle for portability. 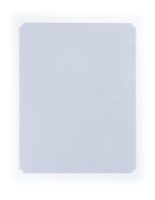 Plastic panels have magnetic strips which hold them in place on the metal frame, making assembly quick. (2) White acrylic shelves for use as a display case or storing spare items. This expo counter can be used two ways! First, businesses can display custom posters up to 1/8" thick with the stick-on poster channels. 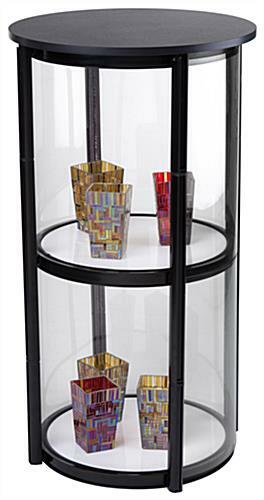 Second, users can simply insert the clear panels without signs to use the stand as a display case for showcasing products. 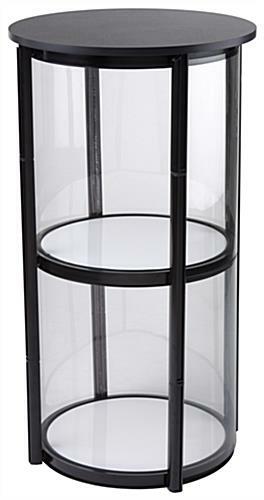 There are (6) panels included with purchase, each of which has flexible plastic construction. Magnets hold each panel in place. 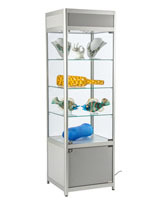 This expo counter is designed specifically for exhibition use. Each twister display comes with a bag to travel to different trade shows. 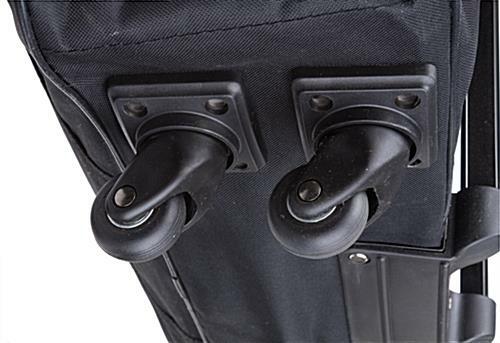 The bag that comes with the expo counter is equipped with trolley wheels and a retractable handle for easy mobility. These collapsible tables have many great features. 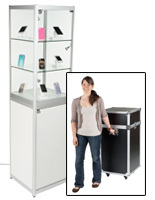 Each twister expo counter, called a portable trade show stand, requires no tools for setting up or taking down. 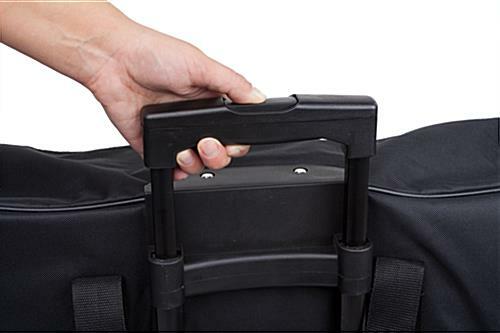 Customers do not need to worry about lugging around a tool box to events. This expo counter twists upward, and then locks into position. These exhibition tables take only a few minutes to set up. 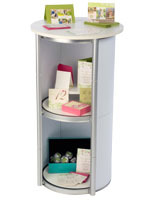 This twister table is an expo counter that is a floorstanding display. 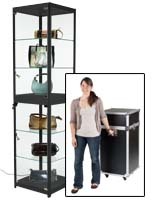 The 42-1/2" height of these collapsible exhibition stands is great for the average consumer. Each trade show table is an expo counter that is great for transporting to different events with the carrying bag. The counter surface is made of MDF (medium density fiberboard) with a black melamine finish. MDF is much stronger than particle board and costs a fraction of hard wood. 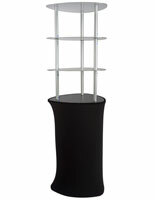 These twister displays also have aluminum shelf supports and side poles. The bars on the side have steel plates in them to secure the magnets on the clear panels in place. These twist and fold stands are affordable for any marketing budget.